Why do the new freedoms and responsibilities of young adulthood cause substance use to change? 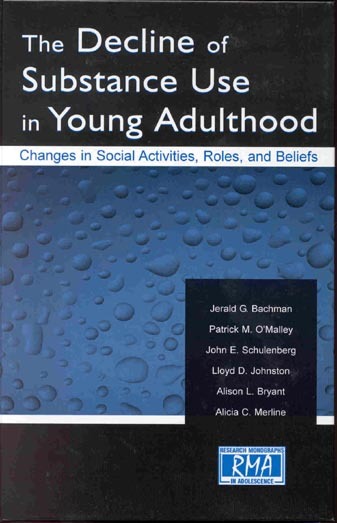 An earlier book in this series showed that the new freedoms of young adulthood lead to increases in substance use, while the responsibilities of adulthood--marriage, pregnancy, parenthood--contribute to declines in substance use. This book examines how the changes in social and religious experiences and in attitudes towards substance use observed among young adults are related to changes in substance use, family transitions, living arrangements, college experience, and employment. The research uses a variety of analysis techniques and is based on the nationwide Monitoring the Future surveys of more than 38,000 young people followed from high school into adulthood (age 18 up to age 32). Specific questions addressed include the following: As young adults experience new freedoms and responsibilities, do their attitudes about drugs change? Do their religious views and behaviors shift? Do their freedoms and responsibilities affect the amount of time they spend in social activities, including going to parties and bars? And how are any of these changes linked to changes in cigarette use, alcohol use, marijuana use, and cocaine use? The research covers the last quarter of the twentieth century, a period when drug use and views about drugs underwent many important changes. In spite of these shifts, the overall patterns of relationships reported in this book are impressive in their consistency across time and in their general similarity for men and women. View a list of chapter titles. To order this book, visit the Lawrence Erlbaum Associates/Taylor & Francis Group Web site.